There’s an ongoing debate in museum circles about the ethics of conservation and restoration of what is categorised as Technological Heritage. Watches fit into this category, and while we may scoff at armchair academic pronouncements on how we should go about maintaining our collections, it’s worth more than a thought. The vintage watch market seems to operate not so much on the ethics of conservation, restoration and preservation of historical integrity, but on the economics of supply and demand as it applies to conserved, restored and indeed refurbished technology. In many cases it’s ‘opinion’ that informs the choice of what to do with a vintage watch and while there are as many opinions as there are people, some opinions carry more weight financially than others. Perhaps not so strangely, the high end of the market, often represented by prices fetched at Antiquorum, Christies, Sothebys and others, reflects a decided bias towards conservation and restoration over refurbishment. On rarer high-end timepieces originality attracts premium prices, while refurbished high-end watches are much less in demand. First let’s arrive at a working definition of conservation, restoration and refurbishment so as to at least have a set of benchmarks upon which we may base our restoration decisions. A concept of conservation emerged about a decade and a half ago in respect to vintage technology and is beginning to have an impact on the serious horological markets. It basically argues that emphasis should be placed on preservation of originality for the future and that making vintage technology appear pristine and never used is analogous to vandalism. The idea behind conservation is that all changes to the object should be reversible. Take dials for example: If one was to take the conservation line when working on a vintage dial, refinishing the dial would be out of the question, but stabilising it with a protective layer of lacquer would, as long as the lacquer could be removed at a later time. The same logic applies to movements. The conservationist would argue that parts should not be replaced because having the technology operating is far less important than preserving its originality. Here’s an example that places technological conservation into a broader context. The Australian War Memorial has a collection of WW2 German military aircraft, and when experts conducted their pre conservation condition survey they identified a grey blue oxide coating on the aircrafts’ aluminium. They conditionally identified the type and constituents of the coating and devised a conservation strategy that ensured the original coating was not destroyed. On similar aircraft in the United States, however, preservation work resulted in the removal of the oxide coating, thus destroying the originality of the technology and giving cause for confusion in scholarly investigation of the future. Many in the field of technological conservation would argue that removing an original coating in order to make the aircraft look new is unethical – same thing for watches and clocks of historical value. Restoration is not identical to conservation. Restoration is a process that attempts to return a piece of technology, in our case a timepiece, to a previous state that a given restorer, complete with prejudices, assumptions and opinions about what the object should represent, imagines to be original. Restoration is personal to the restorer and that should never be forgotten. However, in respect to technology, restoration is controversial, since it often involves irreversible changes to the original material of the technology in order to make it work and function as it was meant to function. In the case of more valuable mass-produced watches or larger volume haute horlogerie pieces, Restoration is favoured by both the ‘expert’ and the knowledgeable ends of the market. Values are higher for working models that are as near as possible to what came out of the factory. The difference between conservation and restoration as it applies to watches is that a restored watch always works. Restoration work does not necessarily have to meet criteria of reversability. In drawing a line between restoration and refurbishment, it could be said that restoration is more painstaking. For example, meticulously removing the markers of a watch, dissolving the damaged top lacquer without destroying the paint and lettering on the dial, applying a new coat of lacquer and then re-riveting the markers without the use of glue or solder is quintessentially a restoration function. Restoration may also involve such things as infilling pitted cases and restoring the original finish, removing gummed-up reverser wheels of an automatic winding system and thoroughly cleaning and re-fitting them, removing hands and cleaning and stabilising them, stabilising dials with patina that has gone deeper that the lacquer top coat, repairing rather than replacing parts, and so on. In a sentence, the basic premise of restoration is to keep the watch as near to ‘factory-original’ as possible. Usually, the expense implicit in restoration dictates that less valuable or collectible watches are better candidates for refurbishment. However, as some Omegas from the 50s and 60s become rarer through attrition, originality may well have primacy in times to come. Refurbishment is often the practice of taking a complete piece, or part, of old technology and making it look brand spanking new again. Refurbishment involves removing an object’s past in the belief the new looking is best or that new looking sells. We see much evidence of refurbishment wherever we look. Old houses rebuilt to look faux grande with more ornamentation than displayed originally; furniture in the brassier antique shops that appears as smooth and new as the IKEA competitor's product down the street; cars of the 50s and 60s chromed to the hilt and modified to reflect modern concepts of a bygone era, and so on. Refurbishment of part, as opposed to the whole, of a watch is generally preferred by all ends of the market except the new-old segment. Refurbishment is generally seen as an option when there are no other options. A watch can be partially refurbished by replacing any part of the watch that is damaged or degraded with a genuine new or restored factory specified part: movement parts, hands, dial, crown, case back, case, bezel, crystal, etc. The essence of refurbishment is to keep to factory specifications but not necessarily to pay much attention to maintaining as much factory originality as possible. In many instances, if a collector sends his vintage watch to, say, Omega in Bienne, it will return having been refurbished. Omega will offer various options as to the extent you want the watch refurbished, and you would be advised to be very explicit in your instructions as to how far you wish to go in the process. It’s fair to say that moderate refurbishment was, and is, the industry standard. In days gone by, consumers wanted their mechanical watches to perform accurately and look smart. 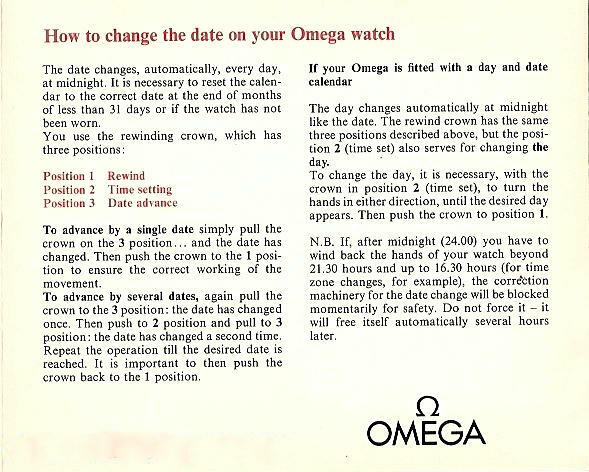 This was reflected in the service bulletins produced by manufacturers who, as a matter of course, would recommend replacing parts, substituting degraded dials, fitting new crowns and crystals and polishing the watch case. But, as models of the 1950s - 70s attain true vintage status, such practices may compromise the aesthetic, historical and monetary value of these watches. The worst acts of refurbishment occur when watchmakers seek to create a new-old watch specifically for the neophyte or non-collecting segment of the vintage market. Usually an overly refurbished watch goes beyond the original factory brief. We see countless examples of Omegas with all traces of their former lives obliterated by excessive polishing; refinished dials completed with varying degrees of competence and unoriginal dial patterns fresh from the overactive imaginations of dial refinishers; so-called new-old stock beads of rice bracelets (as opposed to originals that have been restored); sharp and shiny crowns replacing otherwise functional and nicely worn ones; the dressing up of some models to look deluxe rather than standard; wrong movements (but, hey, who cares no-one buying a new-old watch will probably look under the bonnet) and numerous other touches that compromise the integrity of the original model. Further, the new-old market can get quite excited by a watch that has been made up of mainly new old stock parts, as in the Watchco Speedmasters (an example of complete refurbishment?). While meeting factory specifications, these pieces can be said to fail the ‘history’ test, and, hence, be of much less value to serious collectors or Speedmaster aficionados. Let’s return to the earlier point on opinion and acknowledge that opinions are simply an expression of personal preference. If we are to build up a reasoned argument that favours one opinion over another in respect to the conservation, restoration or refurbishment of mass-produced watches, then we can choose to look at where opinion converges into a body of knowledgeable practice. First, there is a market for new-old in any stream of collectibles, and, judging by the mountain of literature written about the new-old segment of various markets, it’s usually where intrigued amateurs or freshly minted neophytes land. Refurbished collectibles are generally a sellers market rather than a buyers market, because buyers do not make distinctions other than visual appeal and mythical investment value of vintage collectibles, thus placing themselves at the mercy of sellers – same thing with vintage watches. Conservation is the preferred option for important watches and clocks, particularly those that embody technological innovation. Restoration amounts to wanton destruction of heritage. The more rare the object, the greater the case for conservation over restoration. Would a 1970s Calibre 700 Omega Constellation ultra thin circular lever movement limited to 12,500 pieces fit this category? In the case of mass-produced watches, restoration is favoured by both the ‘expert’ and the knowledgeable ends of the market. Values are higher for working models that meet fully a manufacturers specifications. In some cases, a watch that has retained all of its original factory assembled parts, even though regulated to compensate for wear, will fetch more than a restored watch that has had replacement parts. As the vintage watch market has grown both in size and breadth, there is a growing segment that values ‘functional’ restoration – replacement of worn movement parts and conservation that stabilises non-working parts of a watch. Refurbishment of part, as opposed to the whole, of a watch is generally preferred by all ends of the market except the new-old segment. Refurbishment is generally seen as an option when there are no other options. Refurbishment to create a new-old watch has a market for newbies. The prices paid can be high but re-selling values can be severely discounted. So where do I stand? Put me in the Functional Restoration group! Very interesting. Thank you. A 'newby' Omega collector. Very interesting article. I am new to collecting Connies, but have been an American Railroad pocket watch collector for several years. I would also place myself in the functional restoration group. Value aside, watches do differ from other types of collectibles, as they were "tools" to begin with and over their years of use would have been serviced and/or repaired with genuine parts, such as gaskets, crystals & mainsprings etc. In my opinion, if they are restored functionally with original parts and are treated as they would have been within their "normal" life, then I don't believe that we have done a disservice to their heritage. To me that is entirely different than using a restored dial or brand new parts from a currently made watch. In fact, unless a watch has never been serviced in its life and received a new crystal, seals, crown or mainspring, it can never be considered original to a conservationist. Perhaps pieces that serve as the last known example of their type should be left as is, but that is not the bulk of what most collectors own or have access to. Interesting article. I think that it is nice to use your watch rather than keep it in a drawer as would be the case with a none working example. Obviously this requires it to work properly. I bought a 1968 c564 18 kt Constellation, having spent a while looking for one which met my criteria. I found that the self winding mechanism wasn't working properly and that the watch was losing 30 seconds a day. As I intended to use it daily and would have needed to have it serviced anyway, this didn't matter. So I sent it to Swiss Time Services in England (Omega approved Service Centre specializing in the Servicing & Repairing of vintage Omega watches - nothing else!). The watch was fully dismantled, cleaned, a very small cog was replaced as was the mainspring and with original parts. It was then reassembled, lubricated and regulated. I asked that they replaced nothing that they didn't need to, and that they returned any parts to me that were replaced. I also asked that they didn't overpolish it or change it cosmetically. It was in excellent condition to start with - untouched dial, clean movement, etc. It now gains just 5 seconds a day, retains the 50 hour power reserve and winds itself perfectly, looks very original and is in excellent condition. I am delighted with it and will use it daily for a long time to come, having them service it for me every 4/5 years. That way I can enjoy my watch! This is very interesting and really speaks volumes of very hard and painstaking labour poured in this article to say the least. Thanks a lot for sharing and making clear what most of us seem to feel but probably cannot state with such authority and clarity. A great job indeed for all. In this article I felt it important to present the main arguments in each 'camp'. Its nice to know that the agonising I experienced over how to present fairly the various approaches is appreciated. Just found your website. I am one of those who sent my dad's seamaster caliber 562 to Bienne and went through a long period of argument and discussion with the local Swatch company. Needless to say, they insisted on replacing the dial but I told them NO and they refurbished it. I told no repainting but I believe thats what they did and charged me a bomb. The hands were replaced with the wrong type and I had to send it back again for them to install the original hands. Now the watch is back with them to restore the original crown as the replacement did not do justice on the watch. Thanks for your post, the contents of which are the very reason why I do not recommend owners of vintage watches get them refurbished at Omega at Bienne. I don't blame Omega for continuing the tradition of seeking to make an old watch new - its standard practice I suppose - but what I do blame Omega for is not listening and for it arrogance in generally saying to customers that if they don't agree with Omega's plan fopr the refurbishment of the watch the customer can take it away. Interesting - I sit in the new old camp - with gold prices up ten's of thousands of watches are being stripped from their cases - my view is that rather than consign the movements to the bin. There is a huge value in rebuilding them and producing a modern watch from the parts. If it makes no claim to be original then I feel this is a highly valuable and artistic thing to do - I have a vintage original untouched rolex 1960 Sub - I wouldn't touch it - but an old Bulova movement that was mass produced - with no case - if I can design a modern case and a modern dial and give the watch anew lease of life then I feel that I have added value - my work unlike the dial or case produced in a factory will be artisan, hand produced and in my opinion equal to the factory produced watch and hopefully somebody who will look at the reality of the watch and see the sum rather than than just trying to capture some perfect past and will understand and take a pleasure in my work and that which went into the original watch. 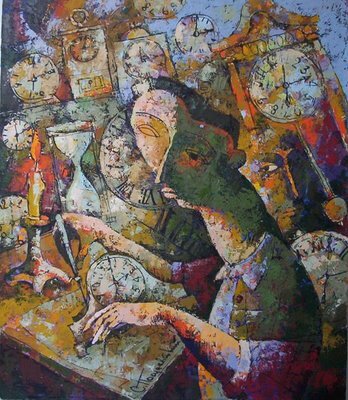 Watches evolve and suffer entropy just as we do and sadly we just glimpse moments in time. I just thought this link may be of interest! No factory original here and these will all be out of most peoples range! Each dial is produced by a real artisan and not a main brand doing a 'generic' dial of the current fashion. Interesting comments, and, sadly, I agree that many collectible 18k pieces are being sold for scrap. Your idea of creating a modern watch 'powered' by by a vintage movement I think is an excellent watch. It's basically the way dubey & schaldenbrand when taken over by Cinette Robert took off again as a brand, having got her hands on supplies of old movements and casing them in interesting cases and dials. There is a good business idea in there somewhere! :) I note that you say you would accurate describe the watch and that is they key I think. I remain in the functional restoration camp - I just love the 'oldness' of some vintage pieces and enjoy patina. Thank you so much for your wonderful site which is incredibly informative and interesting. I want to buy a 1950s 18kt constellation but the one that I am looking at has had a new crown and stem, some wheels, a new plexy, new main spring, sealings and hands, plus a "light" polish. Does this sound like refurbishment gone too far? The dial is untouched. This will be a present for my son's 21st birthday and I want to give something that will retain its value for him. As long as the hands are correct for the watch, it should be fine. I don't see any problem with the replacement parts, which I assume are genuine. You'll be able to tell if the case is still sharp - the lugs should have good definition and the bezel should show a nice crisp chamfer. Thank you so much Desmond. Your site continues to interest and inform me. I agree with one of the other posters that the content should all be compiled into a book. Yes, one day when I'm retired I may well do that. I would very much appreciate it. It is a lot of money for me to find and I don't want to get it wrong! Best regards. Hmm, I see the watch has been 'refurbished' by an Omega service centre. I have no issues with movement parts having been replaced, and the movement appears to have all of its signature parts, however I do have issue with other parts. The hands should be faceted Dauphine hands and they appear too long , the original hands just over-reaching the beginning of the minute index. The case bezel and lugs appear to me to be over polished, to the extent that it has devalued the watch. The dial is not original and has been refinished. So what we are looking at is a classic example of refurbishment as opposed to functional restoration mentioned above. Omega service centres practice a different ethos than that preferred by Omega collectors. For a watch to be 'collectible' it needs to have a sharp case with the bezel showing a sharp chamfer and the lugs having retained their sharp definition. This watch is over-polished and does not meet collectors standards. While it may well go well for a long time, if you are concerned about retention of value I would caution you, because a 4000 Euro price tag is way too much for a watch of this condition. I would value the watch at around 2500 Euro on the international market. I think your sentiment to buy your son a gold watch for his birthday is a wonderful gesture. I'm more than happy to help you in your quest. Please post your email on a post (I wont publish it to protect your anonymity) and we can continue this conversation privately. I recently bought a 1968 constellation with a 564 calibre movement. On closer inspection I have found some discolouration around the edges of the top plate, which I believe might been caused by the use of an overly aggressive cleaning solution at some point; could you tell me if there is a process for re-doing the copper plating on the movement? And if so, would it be wrong to have it done? I'd like to find out before having the watch serviced, and would very much appreciate your expertise. Yes, could be tainted cleaning solution or some other form of corrosive action, Mark. I know of one person who has succeeded in finding a formula to re-plate movement parts with a copper/beryllium solution. His name is Tim Mackrain, and he operates on eBay and other selling platforms as Omega Addict. I know he is fairly busy, but it may be worth a try to have your movement serviced by him and the bottom plate re-done. Thank you very much for the information, and thanks for the excellent blog.